The arms race that is mega cruise ship design ticks one minute closer to midnight on the doomsday clock of obscenity as Norwegian Cruise Lines has revealed its next luxury ship will include the world's first two-level floating race track. Set to debut in 2017 on a China-based route that sails from Beijing and Shanghai, there's no mention if the Joy will be the largest cruise ship to ever launch, but it certainly sounds like it will pack more technological innovations than any ship has seen before. 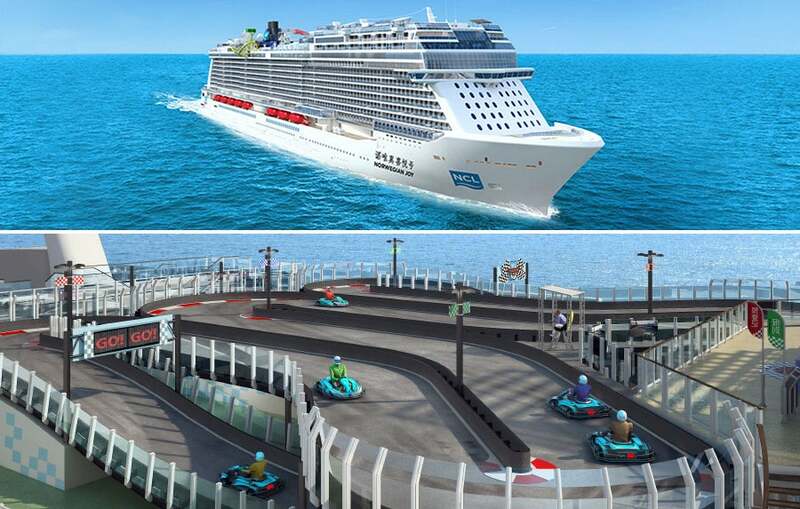 In addition to the twisting go-kart track, the Joy will also feature hovering bumper cars, simulators, immersive rides, virtual reality experiences and a 110m-long water slide that partly hangs off the side of the ship. At what point does it just make sense to leave a cruise ship docked at port for a week? If you're travelling with kids, there's little incentive for them to ever get off at a new port of call. Further adding to the Joy's luxury element will be a private section of the ship called The Haven where passengers who've coughed up a small fortune will have access to one of 74 massive suites, a private covered courtyard and dining facilities and a full-time butler. What, no helipad?